This program upgrades the Hard Disk Photo Storage drive firmware to version 2.19. * Note that some Hard Disk Photo Storage unit already supports 10 languages. Ensure that the battery icon shows at least 2 bars remaining. Otherwise, charge the drive until the battery level is sufficient. 1. Create a folder to store the downloaded file. 2. Save the downloaded file Sony0219_WW_6.exe in this folder. 3. When the download is completed, use Windows Explorer to browse to the folder where the file is saved. Click View and click Details. If the file size is the same as the download size of 483 KB, the download is successful. If the size is different, please delete the file and download it again. Connect the HDPS-M10 drive to the computer. Switch on the HDPS-M10 drive and ensure that it is detected by the computer. Note: Do not attach the AC adapter. Execute the Firmware Upgrade Tool (Sony0219_WW_6.exe). 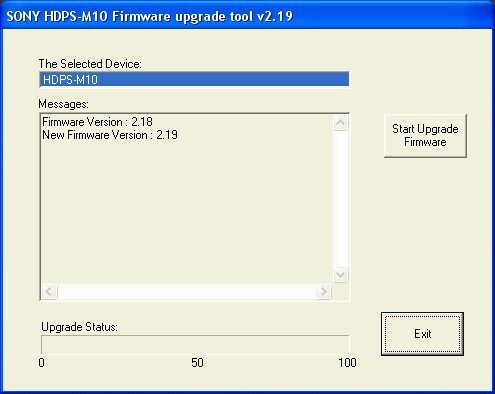 The Firmware Version and New Firmware Version will be displayed. Click on the Start Firmware Upgrade button. The firmware upgrade process will begin. The drive will power off at approximately 1/3 of the Upgrade Status bar. Users will see Please power on device again in the Messages pane. 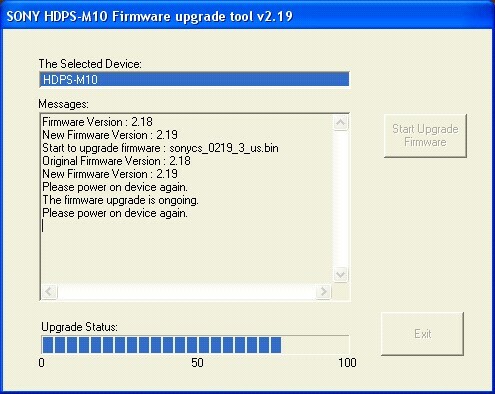 Please switch on the HDPS-M10 drive. 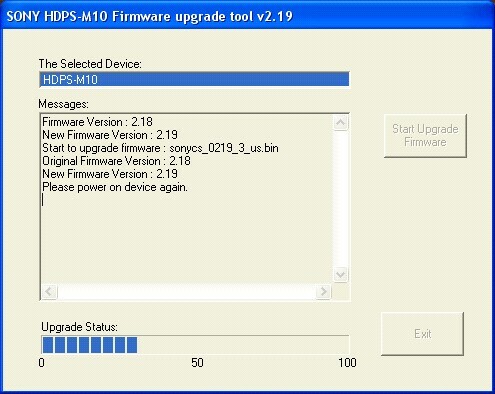 Firmware upgrade is ongoing will appear, indicating that the upgrade is in progress. The drive will power off again at approximately 2/3 of the Upgrade Status bar. User will see Please power on device again in the Messages pane. Firmware upgrade is still ongoing will appear, indicating that the upgrade is in progress. 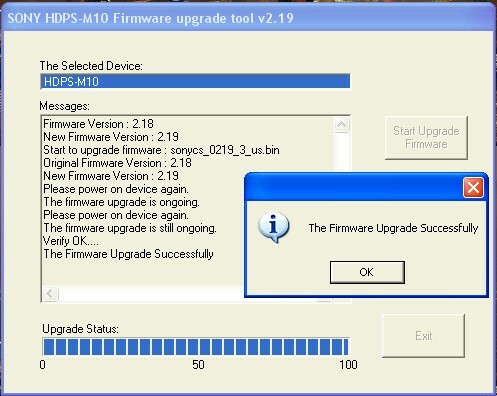 When the firmware upgrade is completed, you will see Verify OK...The Firmware Upgraded Successfully. Click OK on the popup. Click on Exit button to exit the utility. - After the firmware upgrade is completed, the language will be reset to English. If users wish to change to the preferred language, please refer to Language Settings section for the details. 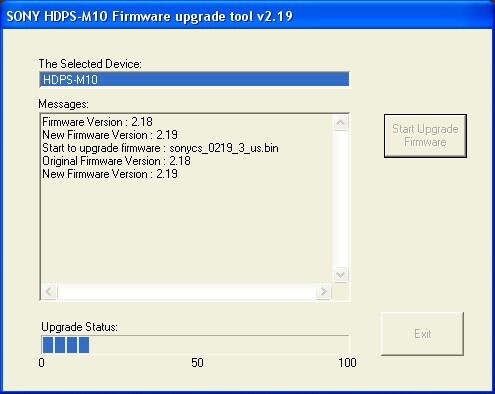 - After the firmware upgrade is completed, users are required to fully charge the HDPS-M10 drive at least once. Turn on the HDPS-M10 drive. The remaining internal hard disk capacity appears on the display after the welcoming screen when no media is inserted in the drives of HDPS-M10. In this mode, press and hold the CANCEL button until the language display appears. Press the CANCEL button to scroll to a language. Press COPY to select the language. Then, press COPY again to confirm. The unit turns off after the selection is made. Turn on the HDPS-M10 to start with the new language for the menus and the messages in the display. Please click here to resolve Error Messages.